Heather says: We've all heard it before. "With great power comes great responsibility." And while it makes sense for many scenarios, I have a hard time not attributing it to Tearaway. Yes, you've been gifted godlike powers and sure, you can use your almighty strengths to change the tiny, paper ecosystem of the game to your liking, but Tearaway also provides a positive outlet for all of your benevolent-god needs: helping a courier deliver a very important message. Developed by Media Molecule exclusively for PlayStation Vita, Tearaway is an ingenious platformer that fully immerses you into a beautiful and lovingly crafted paper world. There you'll experience the true meaning of partnership when you pair up with your messenger and help them traverse through the world to bring you their all-important letter. The mechanics in this game are delightful l and full of integrated options to allow you to help your messenger reach their final goal. Being able to tap the back touchscreen and send your messenger gliding through the air via a trampoline is almost as fun as sending your enemies flying by poking your finger through the construction paper barrier beneath them. It's mechanics like these, fresh and new and fully woven into the core narrative of the game, that make Tearway such a fun and unique platforming experience. Tearaway is so full of bright scenery, quirky enemies, and fresh game mechanics that playing it without a smile on your face is impossible. A buddy game that can be played entirely by one person, Tearaway brings a breath of fresh air to the platformer genre, provides a new definition for co-op games, and takes The Escapist's Platformer of the Year 2013 - Runner Up. Josh says: We didn't catch wind of The Bridge until a few weeks after launch, but I was instantly in love with the Escher aesthetic and mind-bending physics puzzles front and center with the game. Being late to the party, The Escapist missed the review window, as did practically every other publication out there. This just goes to show that not every stellar release will have the hype machine working overtime. 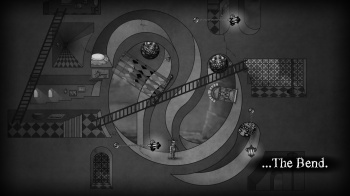 Developed entirely by a pair of graduate students - one artist and one programmer - The Bridge is the epitome of Indie. Published by The Quantum Astrophysicists Guild, a company with virtually no internet footprint, it's no wonder nobody knew of the title when it launched. The Bridge has since been picked up by Majesco's indie publishing arm, Midnight City, and eventually made its way to consoles via Xbox Live in November. What it lacks in hype, The Bridge more than makes up for in unique gameplay and stunning visuals. Forging a world inspired largely by the works of M.C. Escher, this game will have your head spinning from the outset. Each level takes you into another Escher-like puzzle room, where you'll have to manipulate the world around you to complete the objectives. It's not a traditional platformer - there's not even a jump button - but The Bridge offers more innovation to the genre than I've seen in recent memory. The Bridge takes The Escapist's Platformer of the Year 2013 title because of how masterfully it blends the mechanics and aesthetics at the core of the game. The confusion created when you're spinning the world around you, reversing gravity, and crossing back and forth between shadow and light is complemented by the utter chaos of its Escher-esque environment.